Barrio in Cleveland will hold a taco eating contest on May 5 awarding $200/$100/$50. Four Cleveland area restaurants will hold wing eating qualifiers from March 28 to March 31. The Finals at Garage Bar in Willoughby, OH on April 6 will award cash and a 40 inch TV. Registration is open for Cici's 28 inch pizza challenge in Orlando March 20 and Cincinnati on March 25. The overall winning team will receive $2500. The Suburbanite has a report on Dan "Killer" Kennedy eating 4 pizzas and 2 slices to win the first prize of $500 in the PizzaBOGO eating contest in Hartville, OH on October 6. Brandon "Da Garbage Disposal" Clark will appear in an upcoming Travel Channel program recorded at Greek Village Grill in Lakewood, OH. LakewoodObserver has pictures of the recording on Tuesday. The Local Cantina in Westerville, OH will hold a on October 18 awarding a trip to Cleveland for a Fat Head's Brewery tour and Cavaliers game. Dan "Killer" Kennedy ate 34 slices of pizza in 10 minutes to win the first prize of $500 at a contest in Hartville, OH. Defending champion Joey Chestnut, Darron Breeden, George Chiger, Derek Jacobs, Matt Hazzard, Darrien Thomas and Matt Raible are listed as expected entrants in the Zinzinnati bratwurst eating contes in Cincinnati on September 23. Michael Whities has also said he will compete. Derek Jacobs will attempt the Roc-A-Fella's Bomber pizza challenge with host Casey Webb on Monday's episode of Man v Food recorded in Cincinnatti. Amigos in Cincinnati will hold taco eating contests on August 29 awarding $500 to the top male & female. Qualifiers will be held on Wednesdays in August. Steel City Scoop has an interview with Bob Shoudt, who says eating 23.4 pounds of chowder in 6 minutes is his favorite competitive eating record. He will appear at the National Sports Collectors Convention in Cleveland on August 2. Brandon Clark ate a 16 inch sandwich at Submarine House in Centerville, OH in a record 1:14 to win the first prize of $1000 in the Super Duper Cheesesteak Challenge. Dayton Magazine has a profile of Ivan "The Avocado" Mendoza. Winners of qualifiers at tonight’s Cincinnati Reds games. The contest time was apparently moved up due to a rain delay. The Submarine House in Centerville, OH will hold the Super Duper Cheesesteak Challenge on June 9 awarding $1000 to the winner. Entrants need to eat a 16 inch cheesesteak in under 16 minutes to qualify. WHIO has a podcast of an interview with Ivan "The Avocado" Mendoza. Notable omissions include all NASCAR qualifiers and the NYNY Casino in Las Vegas which has held a qualifier every year since at least 2003. The Mets ballpark takes over as the longest running qualifier site. MLE announces that the 2018 Nathan’s qualifier schedule will be released at 2pm Eastern today. 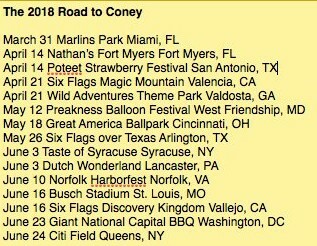 The Cincinnati Reds May 18 and the New York Mets June 24 are probable sites since Nathan’s Famous is listed as a sponsor for those game dates. A qualifier will not be held at the San Antonio Big League Weekend next month since that event will not take place in 2018 due to the NCAA Final Four being held at the Alamo Dome. French Fry Heaven will hold french fry eating contests in Cincinnati and Tempe, AZ on February 24 awarding $500 to the winner. Entrants will need to qualify. The Fairborn Herald has a profile of Ivan "the Avocado" Mendoza, who hopes to be ranked in the MLE top 10. The Wright State student newspaper has a profile of Ivan "The Avocado" Mendoza, who is a senior with double majors in management and human resources who has a 4.0 GPA at that university. There is a also a video. RIP "Tiny" Tim Rauscheder, who passed away on October 30 according to these youtube comments. LA Beast confirmed the passing on twitter. 2013 Cleveland.com article about Tim. The Local: Clintonville in Columbus, will hold a taco eating contest on October 19 awarding $200 to the winner. WLWT has a Facebook video of today’s bratwurst eating contest in Cincinnati. Posts © 2005-2019 ojrifkin · Original design by Beccary · Sponsored by Weblogs.us · XHTML · CSS 19 queries. 19.137 seconds.